Optical Surfaces is located about 5 miles North of junction 6 of the M25 motorway. From junction 6, head north towards Caterham and Croydon on the A22. Continue through Whyteleafe and about a mile further on look for a group of shops on the left, ending with the Kenley Hotel and a Coop store. Our entrance is immediately right through a gate into a car park. Remember, we are not an above ground building, but located in the chalk hillside. 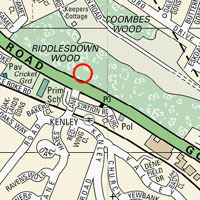 We are three minutes walk from Kenley Station. Services are direct to Kenley from London Bridge and Victoria if their destination is Caterham. Other services, including trains from Charing Cross or Waterloo East, or Gatwick may require you to change at Purley or East Croydon. Please refer to www.nationalrail.co.uk to plan your journey. We are close to four London airports. All link in to the M25 via feeder motorways, and approximate journey times are: Gatwick, 35 minutes, Heathrow 80 minutes, Stansted 90 minutes, Luton 120 minutes.